Breaking news from Cap-Haitien - President Jovenel Moise was poorly received in Cap-Haïtien on Wednesday August 15 2018. People were shouting VIVE Senateur Dieudone Louima, ABA president Jovenel Moise. This happened right in front of the catholic church in Cap-Haitien as the president participated in Fete Notre Dame de l'Assomption Cap-Haitien. 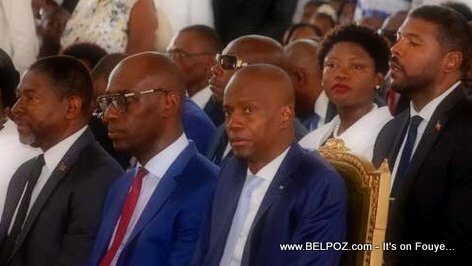 When he was entering and leaving the church, people were shouting "VIVE Senateur Dieudone Lioma, ABA president Jovenel Moise"
How many people? We don't now but the media is talking about it. The strange thing is Senateur Dieudonne and President Jovenel were both elected under the same political party PHTK.